Montreal – August 17, 2015 – Montreal Pride is undoubtedly the summer gathering that cannot be missed when it comes to a singular event where thousands of people stand and march together in solidarity with the LGBTQ communities. Vancouver – August 7, 2015 – Members, staff, and officers from UFCW Canada Local 1518 were loud and proud at the 37th annual Vancouver Pride Parade on August 2, where UFCW activists handed out whistles and waved to spectators as part of a multi-union delegation that marched in the parade. 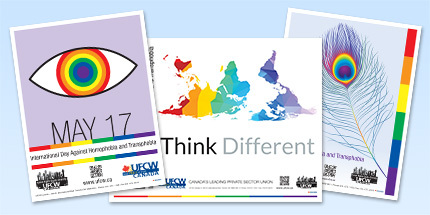 Halifax – August 6, 2015 – UFCW Canada Atlantic activists proudly joined thousands of other participants at the Halifax Pride Parade in downtown Halifax on July 25. Washington, D.C. – July 21, 2015 – UFCW International President Marc Perrone has been featured as a guest columnist in the Washington Blade, one of the most influential publications for members of the LGBTQ community in the United States. Toronto – June 29, 2015 – Summer is here and Pride parades are sweeping metropolitan areas and rural towns to celebrate and advance LGBTQ rights and equality in Canada. Washington, D.C. – June 26, 2015 – Marc Perrone, the International President of the United Food and Commercial Workers Union (UFCW), has released the following statement in response to the United States Supreme Court’s decision in Obergefell v. Hodges. Free online learning for members and their families.